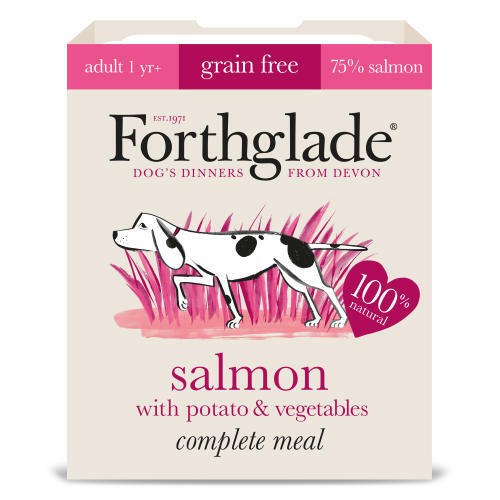 Forthglade Complete Adult Salmon with Potato & Vegetables Grain Free is a highly nourishing and suitable wet complete meal for dogs from 1 year of age. Free from fillers it is made with completely natural ingredients. This is best-friend food and tail-waggingly good! •	Nutritionally Balanced –Salmon is a good source of protein that is easily digestible and very palatable. Salmon is also high in health promoting omeaga-3 oils. •	Grain Free – Zero grains added to this recipe, ideal for dogs with sensitive stomachs. •	Botanicals - These natural herbs are added to help aid the body’s natural defences. •	Omega 3 – increased levels are added to support immunity and encourage healthy skin and coat condition. •	Minerals, vitamins & pre-biotics – Chelated minerals are included to help improve nutrient absorption, and prebiotics to promote an increase in ‘good’ gut bacteria. •	Steam Cooked – A little water is added to help everything cook slowly and at a low temperature to retain all the natural goodness. Simply add to a quality mixer biscuit for a balanced meal or use as a delicious topper with dry food. It’s also great to mix in with fibre filled vegetables and carbohydrates such as brown rice and potatoes. If it’s the first time you are feeding your dog Forthglade, introduce it gradually over a period of 5 days. It will take between four to eight weeks to see the benefits. Analytical constituents:Crude Protein 10.5%, Crude Fibres 0.3%, Crude Oils & Fats 10%, Crude Ash 3.5%, Moisture 70%.